This page contains pictures and information about Bee Flies in Subfamily Anthracinae that we found in the Brisbane area, Queensland, Australia. Anthracinae is a common Australian Bee Flies subfamily. This is a very large Bee Flies subfamily. Bee Flies in this subfamily usually large and stout. There are usually patterns on clear wings with patterns on the costal margin area. 3. 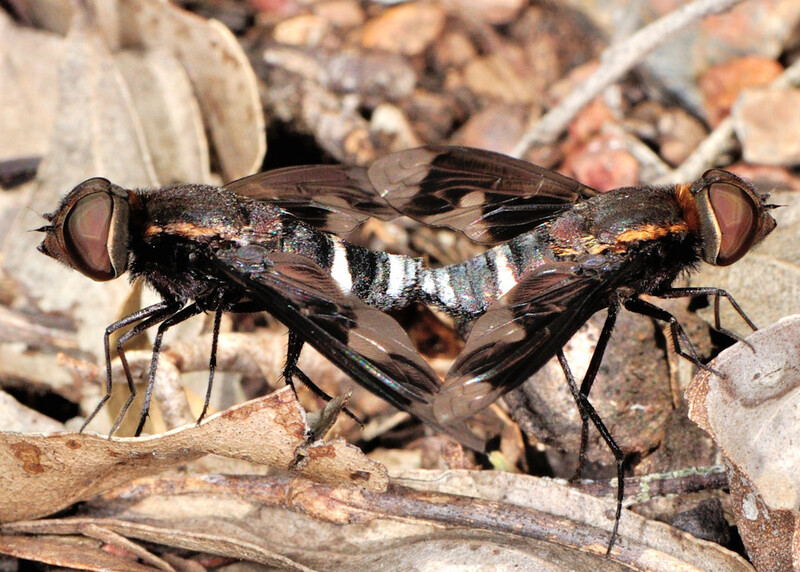 Family BOMBYLIIDAE - Australasian/Oceanian Diptera Catalog - Web Version, by Greg Daniels. 4. Cryptic species diversity and character congruence: review of the tribe Anthracini (Diptera : Bombyliidae) in Australia - David K. Yeates and Christine L. Lambkin, 1998. 5. An evolutionary radiation of beeflies in semi-arid Australia: systematics of the Exoprosopini (Diptera: Bombyliidae) - Lambkin CL, Yeates DK & Greathead DJ, Invertebrate Systematics, 2003. Last updated: November 30, 2012.